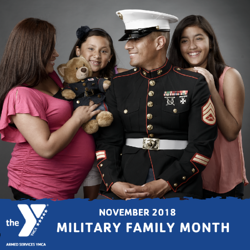 "Military Family Month is another way that the Armed Services YMCA recognizes the sacrifice and commitment of our brave service members and their families," said William French, ASYMCA President and CEO. "It is truly an honor to support the families that serve our country." Military families face obstacles that many civilian families couldn’t even imagine. Military children move six to nine times during their school careers, making it difficult to build friendships and military spouses are tasked with securing employment with each new change in duty station. Junior enlisted military families struggle to make ends meet and frequent transitions often leaves them feeling isolated. 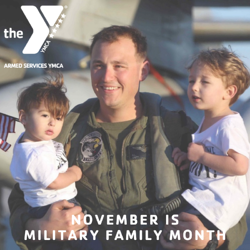 The ASYMCA works closely with military installation commanders to address these issues by providing programming that meets the specific needs of military troops and their families. Camps and Camping which encourages healthy living as part of our core mission of strengthening our military family, and provides much needed recreational and bonding opportunities for military children and families who have experienced multiple deployments. Operation Little Learners which provides military parents with the tools to enhance the developmental areas of their child and offers opportunity for early learning and bonding. Operation Little Learners also connects military families to a support network filled with other parents and children experiencing similar challenges. Children’s Waiting Room is a child care program located inside military and civilian hospitals that allows parents to attend scheduled appointments without the stress of having to find child care outside the hospital. When families have the ability to drop off their children inside the hospital at no or low cost, they are more likely to attend scheduled appointments, and in locations with Children’s Waiting Room hospital administrators report a 30% drop in no show rates. Child Care & Preschool have consistently proven overwhelming costs for junior enlisted service members and their families. ASYMCA offers accessible, quality child care and preschool programs at affordable rates in order to prepare children for future success by teaching social skills, creativity, literacy, and fine & gross motor skills. Operation Hero is an after-school enrichment program designed to address issues faced by many military children. Military children bear a tremendous amount of stress related to frequent moves, parental deployment, and trauma resulting from the wounding or loss of a mother or father. Operation Hero provides a safe environment where these children can express their emotions, receive academic and emotional support, and connect with peers who are experiencing the same challenges. Military Family Month is a month-long celebration to honor American military families around the globe who sacrifice so much to protect our freedom. Stay tuned for the annual Art & Essay Contest announcement. Celebrate a service member with us all month on social media using #MilitaryFamilyMonth.